This quaint and very comfortable 2 bedroom, 2 bath property is located on desirable Dolphin Drive in the Cape Coral Yacht Club area. Across from multi million dollar homes you have the Caloosahatchee River that connects directly to the Gulf of Mexico. Walking distance to the Cape Coral Beach, the Pier as well as the Boathouse Restaurant. This home has been tastefully decorated and is ideal for 4 people. The swimming pool has been added in 2017 and so has the electric swimming pool heater and landscaping around the home. 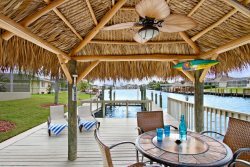 This house has many features and makes for the perfect vacation rental in tropical Southwest Florida. Diese schoene idyllische Ferienvilla liegt am Dolphin Drive in Cape Coral. Gegenueber gelegen von Millionen Dollar Hauesern welche direkt am Caloosahatchee River liegen bietet die Nachbarschaft ein tolles Ambiente. Der Cape Coral Yacht Club, Pier, Boat House Restaurant sowie der Strand sind in 5 Laufminuten zu erreichen. Das Haus Haus selber bietet 4 Personen genuegend Platz um sich in den beiden Wohnzimmern zu entspannen oder den 2017 erbauten Swimming Pool zu geniessen. Dieser ist elektrisch beheizt. Der Garten wurde auch 2017 neu angelegt. Die Lage sowie das Haus bieten ein perfektes Paket fuer einen tollen Urlaub in SW Florida. Both Vanessa and Bob were very friendly and accomodating throughout the rental process and check in. Very stress free. The property was very comfortable. Sitting by the pool gazing at the royal palms in the distance was so relaxing. A newer Weber gas grille allowed us to have several cookouts with family members in the area (a local Costco store sells prime cut steaks at bargain prices). A daily walk to the fishing pier followed by a refreshing beverage at the Boathouse was enjoyable. I really appreciated the detailed instructions for check-in and check-out that were sent to me via email. The purpose of our trip was to allow my son to play in a baseball tournament. It would have been extremely inconvenient to have to meet someone to complete a check-in process. I also appreciated the detailed check-out instructions. We planned a trip immediately following our stay in Cape Coral and had to leave very early in the morning. It was great to know exactly what we needed to do to check out. The entire process was very efficient! The group gave us three beautiful properties to choose from. They answered all of my questions so that I could identify the best property for our needs. the home was very clean, fantastic location and had everything we needed. 5 Star. There was a mix-up of some kind as upon our arrival at 4.40 on the 25th of March the cleaning lady was still working in the house and she seemed to think that we were supposed to arrive only on the following day. But this was no big problem for us as she promised to be ready in 20 minutes. The property manager who came by the next day was very helpful and friendly. Upon departure, we were told beforehand that the check-out time was at 10 am. But then we received a mail saying it was at 11 am. I sent an e-mail telling you that we would like to leave before 10 am, as asked, but I never got any answer to that. So we just left at 10 am, I hope that was all right. The house was perfect for us, very clean and well equipped. Our only wish would have been to have a little more written information, like on the recycling possibilities, the trash pick-up, the use of the pool and the washing machines etc. We were able to ask these things of the manager who came by but a lot of these things come to mind only gradually. In the kitchen, it would have been nice to have a water boiler for tea. Whenever there was a question about the property, we received an answer in an appropriate time period. We had an excellent stay at Seahorse house on Dolphin. The house is very well equipped, the neighbourhood is quiet, the location is excellent as it is so close to the Yacht club beach and the pier. The pool is the perfect size. We would highly recommend the property, although it is a two-bedroom and would be a bit tight for more than 4 people.